The endless India-Pakistan sabre-rattling over Siachen glacier and the Line of Control can be resolved by turning the area into a peace park for glacial and weather studies. At altitudes of 13,000ft and above, the bleak but beautiful Siachen Glacier valley is a hotly contested spot. THE origins, course, consequences and lines of resolution of the Siachen glacier imbroglio have been misunderstood, confused and even mismanaged over the years. Pakistan’s solution calls for an Indian withdrawal from the glacier, a mutual pull-back and demiltarisation. India however insists on authentication and demarcation of the AGPL (Actual Ground Position Line that it holds) before redeployment to mutually defined positions, to prevent the vacated area being otherwise stealthily seized. Nevertheless, the Kayani initiative should be pursued so that no opportunity for peace is lost. Both Siachen “solutions”, however, beg the question. There was no AGPL prior to 1984. Where then did the northern extremity of the CFL/LOC lie? The critical date is therefore not 1984 but 29 July, 1949, when the Cease-Fire Agreement was signed in Karachi by ranking military representatives of India and Pakistan and the UN Military Observer Group in pursuance of the key UN resolution of 8 August, 1948. The Karachi Agreement delineated the entire CFL and demarcated 740km on the ground until “Chalunka (on the Shyok River), Khor, thence North to the glaciers”, passing through grid reference NJ 9842. The segment, beyond NJ 9842 was by mutual agreement not demarcated on the ground, being a highly elevated, glaciated, unexplored and unpopulated region that had not witnessed any fighting. A plebiscite was soon to follow and the matter, it was assumed, would soon be settled. The delineation NJ 9842, “thence north to the glaciers” was unambiguous as the very next section crucially directed that “the “ceasefire line described above” be drawn “so as to eliminate any no man’s land”. At Shimla, Mrs Gandhi demanded acceptance of the redrawn CFL, accommodating the gains of war, as a Line of Control initiating a transition from military confrontation towards a political settlement. Bhutto demurred, pleading time, and she accepted his honeyed assurances that he would take steps to promote the LOC’s evolution into a permanent boundary. But no sooner were his POWs back home and his lost territories in the West restored than he raged and reneged. Even so, when Pakistan later sought to incorporate the Northern Areas within its territory, still later when it announced construction of the Basha-Diamer dam, and yet again when it conferred a limited constitutional status on Gilgit-Baltistan, India protested against infringement of its sovereignty, betraying policy inconsistency in its stance on the contours of a final political settlement in J&K. All Pakistan, UN and global atlases depicted the CFL neutrally or correctly till around 1964-72. By the mid-1950s, China had commenced its creeping cartographic aggression in Ladakh. 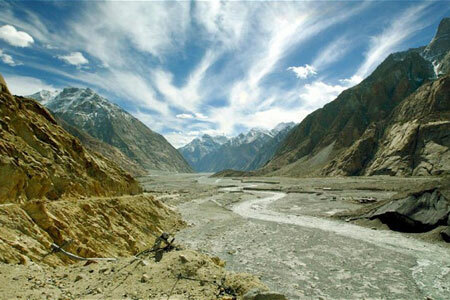 In 1963 it signed a boundary agreement whereby Pakistan unilaterally ceded the Shaksgam Valley. Thereafter, Pakistan kept extending its lines of communication eastwards and began licensing western mountaineering expeditions to venture east of K2. It was emboldened to extend this “eastward creep” when, between 1964 and 1972, the US Defence Mapping Agency, an international reference point for cartography, began depicting the CFL as extending from NJ 9842 to the Karakoram Pass. The most charitable explanation for this totally unwarranted action was that it erroneously hardened what was possibly no more than an extant dotted World War II air defence information zone (ADIZ) line into a politico-military divide. Pakistan gladly accepted this fraudulent international endorsement and thereafter initiated moves to occupy Siachen. Reconnaissance teams were sent to the Saltoro Ridge, Siachen’s western wall, in 1983. Getting wind of this stratagem, India, pre-emptively occupied the Ridge and glacier in March 1984. At a US Institute for Peace conference on J&K in Washington in 1991, delegates were delivered a map that depicted a hatched triangle NJ 9842-Karakoram Pass-K2, and Shaksgam in the north, with a legend reading, “Indian occupied since 1983”. The conference organisers disowned what they surmised could be a CIA map.The map not only confirmed Pakistan’s claims but labelled India an aggressor. Years later, US Ambassador Robert Blackwill said the US Defence Mapping Agency had got its lines wrong and that the impugned maps would be amended. Nothing ensued. If the USDMA map was a product of genuine error, howsoever irresponsible, it would have been natural and simple to apologise and make appropriate amends. Nothing of the kind happened. Nor did the Indian Government respond to any of these alarm bells. The American scholar, Robert G. Wirsing elaborately researched the matter in his “India, Pakistan and the Kashmir Dispute: On Regional Conflict and Its Resolution” (Rupa 1994). He observed that by the early 1980s, “a nearly universal shift by (international) map-makers to an extended and eastward -running CFL/LOC (from NJ 9842 to the Karakoram Pass) was eventually achieved. .…One can hardly escape the conclusion that the US Defence Mapping Agency, one of the largest and probably the most influential of international map-makers, played a far from inconsequential role in the world’s “cartographic award of Siachen to Pakistan”. If innocent absent mindedness on the part of one or more official US agencies is not altogether convincing, where else might one look for possible explanations. The Sino-Soviet rift was out in the open and the US, having extricated itself from the Indo-China quagmire, had begun to review its relations with the People’s Republic of China, now a nuclear power. The Sino-Pakistan rapprochement post-1963 made Pakistan a critical conduit for quiet Sino-US talks. Kissinger headed to the subcontinent to stave off the possibility of an Indo-Pakistan war on account of the Bangladesh liberation struggle, a mission famously overshadowed by his secret dash to Beijing from Islamabad and the ensuing announcement of a Mao-Nixon meeting. The Indo-Soviet Friendship Pact was signed and the notorious “Nixon tilt” against India went into play. Kissinger Transcripts by William Burr (1999) makes the extraordinary disclosure of the Secretary of State encouraging the PRC in December 1971, through its UN Ambassador Huang Hua in New York, with whom he was now in very close touch, to move against India in order to divert it from severing Bangladesh from Pakistan, a mutual ally. The US reassured Beijing that it would counter any Soviet riposte. Nixon had already ordered a US naval flotilla into the Indian Ocean to show the flag, although this might ramp up tensions with the Soviet Union. Was it in the background of this bizarre play of events that US map-makers started fiddling gratuitously with India’s strategic boundaries? Look now at the implications of the options being canvassed for resolution of the Siachen matter. Any unqualified redeployment from the Siachen glacier without asserting the correct delineation of the CFL/LOC from NJ 9842 “thence north to the glaciers”, will mean accepting the Pakistan claim and throwing the August 1948 UN Resolution and derivative 1949 Karachi Agreement into the dustbin. This “mother” Resolution on J&K implicitly found Pakistan the aggressor and intruder, required its military personnel and tribal cohorts to leave the State forthwith, and upheld India’s de jure sovereignty over the entire State even while preparations were made for a plebiscite. On February 4, 1949, the U.S representative, Senator Warren Austen, told the security Council that “with the accession of Jammu and Kashmir to India, the foreign (external) sovereignty (over Kashmir) went over to India and is exercised by India, and that is how India happens to be here as petitioner”. The LOC is a subsequent derivative of the 8 August, 1949 Resolution that drew the CFL. The Manmohan Singh-Musharraf 2005 peace formula sought to sanctify the LOC as an evolving international boundary, rendered porous as “a mere line on a map” across which movement, investment, commerce, exchange and cooperation might be encouraged and joint institutions allowed to develop for their management. This offers a viable win-win solution for all with regard to J&K. But unless the LOC is firmly anchored to a northern terminus it could unravel, leaving everything for grabs. The AGPL is a new military line. It defines post-1984 ground realities and necessarily follows a natural feature, namely, the Saltoro Ridge. Redeployment from there would be a mere military re-positioning that would leave untouched the political question. Fiddling with the internationally-delineated LOC will entail moving from an objective to a subjective definition of that Line. At the end of the day the AGPL is an irrelevance if the objective is a political settlement. A way out could lie in quiet authentication of the AGPL through an exchange of letters. This should be combined with agreement on the only true meaning of “NJ 9842 thence north to the glaciers” leaving no room for any no-man’s land to clearly mark a firm boundary. An understanding on converting the NJ 9842-K2-Karakoram Pass triangle into a demiltarised Third Pole International Peace Park for Glacier and World Weather Studies, would foreclose risk of any clandestine military occupation of the vacated AGPL or adjacent Pakistani positions by anybody. None need lose face. All would gain. Abridged from an Occasional Paper published by the CPR, Delhi. See a collection of writings at www.BGVerghese.com / Veteran columnist, developmental journalist, author, and Magsaysay Award winner, BG Verghese started his career with the Times of India and was later Editor of the Hindustan Times (1969-75) and the Indian Express (1982-86). He was Information Adviser to the Prime Minister (1966-69), a Gandhi Peace Foundation Fellow for some years after the Emergency and Information Consultant to the Defence Minister for a short period during 2001. He was later with the Centre for Policy Research, New Delhi. Verghese passed away on 30 December, 2014, his pen busy right until the end.